In a market full of cheap pen tool sets this one from Rockler stands out because of the quality, user-friendly handle design and the replaceable cutters. 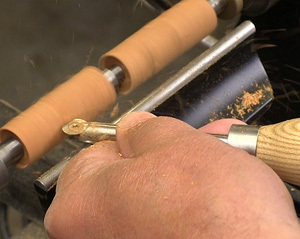 Turning pens is a favorite project of just about anyone who owns a lathe. You don’t need a giant machine or tools to make beautiful pens but having sharp, consistent cutting edges is mandatory to get the shape and finish we all want. The Rockler Carbide Pen Turning Tool 3-Piece Set (#47600) gives you three versatile cutter shapes that help you be more creative and efficient when turning pens or other small projects. The Carbide Pen Turning Tool 3-Piece Set can also be very handy when adding fine details to larger turning projects as well. The Carbide Pen Turning Tool 3-Piece Set includes one 1/2" round carbide cutter, another with a 1/2" “square” cutter that actually has a 2" radius that makes it much easier to create smooth surfaces with less tendency to catch and a HSS (high speed steel) 1/8”-wide parting tool. You also get a hex wrench for turning or replacing the carbide cutters and a case that both protects your tools and keeps them together for when you need them next time. The Carbide Pen Turning Tools are just 9-1/2" long but that is a great size for the detail work for which they were designed. Whether you are turning pens, bottle stoppers, handles or other relatively small items this collection of cutting edges gives you lots of versatility in easy to use tools. Both the round and square carbide cutters (left) can be turned to use a fresh, sharp edge when the current one eventually goes dull. 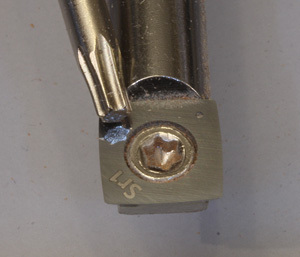 Rather than a cheaper fastener Rockler chose to use this star pattern screw (right) that comes with a nice "key" that makes it nearly impossible to strip this screw out. Nice touch! The two carbide cutters stay sharp far longer than regular steel but the reality is that everything will dull eventually. When these cutters do get dull you can rotate them to present a brand new, sharp edge to the work. The round cutter can be turned a small amount to get to a fresh edge while the square cutter essentially has four factory-fresh edges. When you use up all of the cutting edges you simply replace the carbide cutter. And you can buy an impressive pile of these cutters for what an even rudimentary sharpening system can cost. The square carbide cutter sells for $19.99 (3-10-2014) and the round one for $17.99. These cutters were designed specifically for these tools and cannot be used on other handles. The “square” cutter has a 2” radius on the edges because a truly flat edge makes it nearly impossible to cut a flat, clean surface. That little bit of radius helps keep the corners of the bit from digging in and creating annoying lines or even catches that can ruin a project in a flash. When replacing the square cutter use SR1 (#47377) that is designed specifically for this tool. 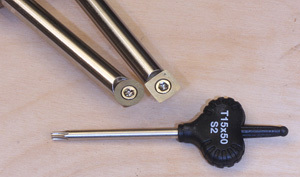 The first thing I noticed about the Carbide Pen Turning Tools is that they did not feel “handle-heavy” to me as many of the smaller turning tools have. These feel more balanced because of the substantial mass of the shanks used to support the carbide cutting edges. The parting tool also feels well balanced in use. Whether you are turning pens (left) or adding details to a larger project (right) the Rockler Carbide Pen Turning Tools make the job easier and more efficient. Somewhere between the handle shape, the ultra-sharp cutting edges and the balance the Carbide Pen Turning Tools are very easy to control when put to wood. Small turning chisels have the annoying tendency to chatter if you are not careful but Rockler’s Carbide Pen Turning Tools do not suffer from that trait. I was able to take deeper cuts than I normally use without chatter or that feeling of impending chatter/catch. That results in smoother surfaces and accurate control when you are cutting shapes or finalizing surfaces. In addition to turning the pen shown in this review I chucked up several pieces of scrap and played with the Carbide Pen Turning Tools to get the feel of them, to explore their capabilities. That extra turning also let me better see how long the carbide cutters held their edge. It turns out that those edges outlasted me and I gave up trying to wear them out. I know they will eventually go dull with enough use but changing to a fresh portion of the cutting edges appears to be less frequent of a task that I expected. That translates into buying fewer replacement cutters down the road for you. The Rockler Carbide Pen Turning Tools are well made, feel very balanced and certainly have tough carbide cutting edges. The cutter shapes included really give you a wealth of capabilities when turning small projects or adding fine detail to larger objects. The rubber, ergonomically shaped handles are also a big improvement over similar tools on the market. I think you will find yourself reaching for the Carbide Pen Turning Tools more often than you might think. 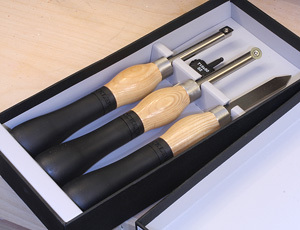 With a street price of $129.99 (3-09-2014) this set of three turning tools is a very good value for such well-made tools. The changeable carbide cutting edges mean that tuners without sharpening machines can also enjoy working with always-sharp tools and save money in the process. I’ve liked the idea of replaceable carbide cutters since I first saw them and now they have come to smaller turning tools as well.